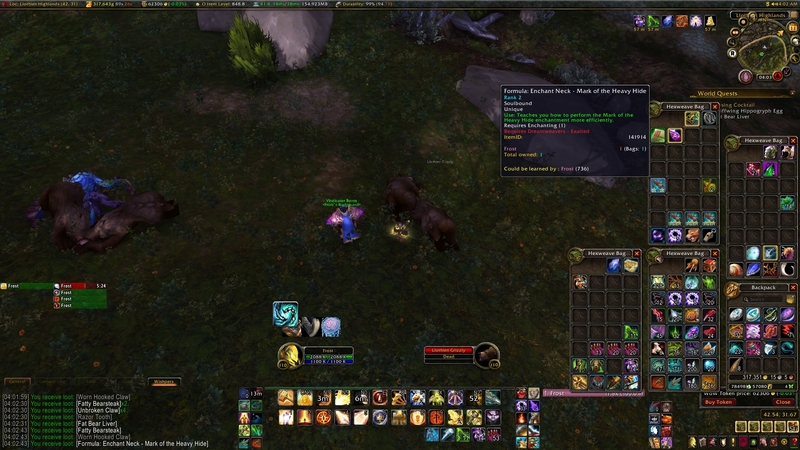 While doing the world quest Um coquetel purificador the mob Urso de Llothien dropped the enchant for me. Everyone has to collect their own eggs. So naturally there are like 4 eggs and 800 bears in the area. Reminiscent of quests from Vanilla where the quest item has a low drop rate on the mobs. Killed 20+ bears to get my fatty livers. Those Hippogryphs are surprisingly chill about the fact that we are stealing their eggs. There is not enough bears for this, compared to how easy it is to get eggs. This video tries to show the closest flight point, route and way to complete the quest. Some of the bears seem to be surviving without livers, and the hippogyphs let you steal their eggs. Visão da Rainha Azshara to Farondis: "And look at you now! A spectre of your former self, cursed to an eternity of undeath and ineptitude." Eggs can also be outside grizzly dens; I guess the bears swiped some for later. The flavor text on this item is a reference to the cancelled Warcraft Adventures game. Gryphon eggs were said to need a warhammer to crack.